The trouble with meetings is the preference for information and disinterest in taking action. How many people enter meetings prepared to take action, change behaviors, or adjust strategies? Preparation enables action. Information that doesn’t impact behaviors is irrelevant. Send an email or video report before the meeting. Meet to ask questions, explore options, make decisions, and get things done, not to distribute information. The meeting isn’t necessary if behaviors typically stay the same after adjournment. What’s the point when people sit around listening to statistics or reports leave the meeting doing the same things? 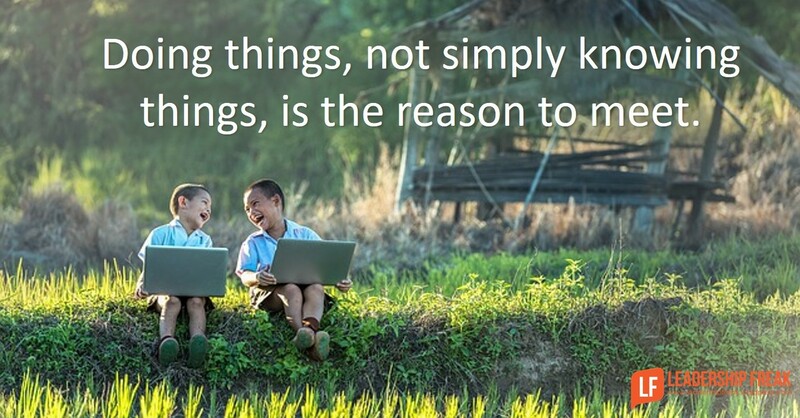 Doing things, not simply knowing things, is the reason to meet. Invite participants, not observers, to sit around the table. Anyone who leaves the room without something to do shouldn’t have been there. Minimize the number of ‘information’ meetings. Send an email or video. Create a dashboard. Don’t call meetings to simply give reports. Expect commitment. All participants must know why they’re in the meeting and are committed to achieve shared outcomes. Translate information. Translate information into observable behaviors and near-term outcomes. What happened in the past isn’t as important as what you’re going to do about it. The only reason to discuss the past is to use it to aid action. Design action. Who does what by when? Stop holding meetings that have no behavioral results. What essential role does information-sharing have in meeting? How might leaders move toward taking-action meetings? I’m currently in the process of developing a training presentation on exactly this topic! In all of the research I’ve done, the one thing that keeps surfacing is the importance of creating an agenda and sending the agenda in advance (when you send the meeting request). By creating an agenda with topics assigned to meeting attendees, it ensures you’re targeting the participants, not just observers in the meeting. Check out David Grady’s TED Talk on saving the world from bad meetings. It’s a funny, but realistic account of how accustomed we are to accepting “actionless” meetings. Thanks Elyse. I appreciate how you extended the conversation. If we expect people to participate, what are we doing from a system/process point of view to enable that? An agenda that is tied to participants makes a lot of sense. I just forwarded this post to a number of seminarians. Not only does this post apply to meetings, it applies to preaching. Preaching without application is simply conveying information. A preacher wants to see commitment to change. Thanks Pete. I’m often surprised how leadership ideas have broad application. Thanks for sharing. I think the meeting tips are great. Many times one goes into a meeting when it was unnecessary and could have been explained in a simple email. Coming out with action items helps to target the point of the meeting and what needs to be done to finish a project. It is helpful to use the last 15 minutes of every meeting to go through what action items are assigned to whom and when these should be due in order to keep projects moving along. Thanks Mitra. I find that I run meetings right up to the deadline and try to cram in the action steps. Your suggestion is simple and actionable. Put ‘action items’ on the agenda. Dan, I want to introduce you to Mitra, my graduate student at Tulane who is finishing her studies with the last requirement – Leadership Practicum. One of my requirements in the Practicum is to comment on your posts at least three times per week during the semester. Thanks Jim. What a useful assignment! 🙂 I look forward to Mitra’s insights and yours as well! Great post, Dan! I have started reinforcing and encouraging managers who take actions in the meetings. My hope – positively reinforcing the right behaviors should encourage action-focused meeting more. Thanks Niraj. I think it takes intentional focus and persistent work. Thanks Nahum. Success is a journey. Best wishes! Another great post, Dan. Thank you. I often think that meetings are often driven by Either/Or forces: Either we have to focus on gathering all the available information, Or we have to react on the information we have. There’s a needed balance, and I really like your comment that “Information that doesn’t impact behaviors is irrelevant.” Colin Powell summarized the issues of Relevant and Irrelevant (and Missing) Information very well, and I find it worthwhile to review them often (http://wp.me/p2k440-3j) both in meeting preparation and in decision making. Thank Jim. You bring up an important and challenging idea. How much do we need to know before we start taking action. Thanks also for extending the conversation. Whenever possible learn as you go. Of course there are some leadership decisions that don’t allow for learning as you go. You don’t want surgeons and pilots learning as they go. 1) Leaders of meetings need to indeed come prepared to take action and have those around them take action. As you said, if they leave the meeting with nothing to do, why were they invited? 2) We do not always get to be the “leaders” of meetings and to change the culture from one of inaction/information sharing to one of action sometimes means asking the questions of “how do I fit into this?” or “what can I do to help move this process along and when?”. We are ALL far too busy and our time too valuable to just sit in meetings all day and not advance ourselves or our businesses. Great post! This is short, but adds unique information to the usual “have an purpose and agenda” listicles that you usually see. I fully support the notion that meetings are about decision, action and problem resolution. Meetings are a poor medium for information sharing. One thing that I have noticed is that it really helps to craft agenda items as discrete units of “work”. Think of them as tasks or jobs to be resolved. It really helps to write them in the form of a question. You either answer the question on the spot, or come up with additional actions you need to get the question answered. Also, I’m building Instant Agenda (http://instantagenda.com) to help people implement these practices consistently. There are plenty of meeting tools available, but the reason I mention it here is because of our unique focus on treating agendas as “work to be done” and our focus on action items. For those interested in doing what you suggest here, I would recommend that they give it a try. Thanks Michael. Congratulations on working to make the business/leadership world more efficient. Agendas as “work to be done,” is a powerful statement. In this age of technology, there are much simpler and cheaper ways to transmit information. Too often meetings are held for the sake of meeting the narcissistic attributes of the person leading the meeting. Oh to have the thousands of hours I sat in meetings over the past 42 years I’ve worked would be divine. Your comment, “Anyone who leaves the room without something to do shouldn’t have been there” is an excellent measure to use when inviting participants to a meeting. Something that sticks out for me is having “the authority to implement” what is being discussed on the solution side, often times meetings are reinventing the wheel as we know so well. Without the authority to implement what is best for the company we just wasted a large amount of time, money, etc. as Jim Leemann points out in his stats. Actions without backing are merely wheels spinning in the sand. Based on your points of interest agendas and assignments would be keys to moving a company forward for sure in their meeting proposals! Fabulous insight Dan as always. Thanks Tim. You really nailed an essential idea. Either the team or someone on the team should have authority to implement. A decision apart from implementation is a waste. Perhaps we should say that a meeting should never have anything on the agenda that it can’t take action on….maybe that’s a bit too limiting. I concur anything on the agenda that we can’t take action is too limiting, to actually pinpoint action agenda compared to non-action may be a bit overstated. The point is to coordinate in a positive fashion to shape the business, company, or followers. Action without results is worthless. Yep. That’s why I’ve stopped attending COA and meetings with ESA. We have too many meetings where all everyone does is talk and complain without developing any strategies and plans of action. I think that is what’s happening with the Negotiated Settlement discussions for the WQCP! That’s why there is not progress.